Most students come to law school to get a full time job as a lawyer. Eighty percent of the University of New Mexico School of Law Class of 2014 are employed in full time, long term positions requiring passage of the bar examination, well above the national rate of 60 percent. This is the third year in a row that the UNM School of Law has surpassed the national employment rate in this key metric by more than 12 percent. UNM School of Law graduates also had better success than many recent law graduates across the country, surpassing Yale's employment outcomes and those of peer schools in the Southwest. Mirroring the school's admission policies, most graduates stay in New Mexico. For the class of 2014 that rate is 85 percent. 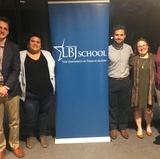 From their very first semester of law school, the Office of Student and Career Services works to help students imagine, plan and start their career. Throughout their experience at the UNM School of Law, students take classes that focus on developing their professional competencies. “Students also are supported by faculty and alumni who are devoted to our students’ success, which contribute to our very strong employment rates. The strength of this professional network is unlike any other I have encountered and I believe is tied to the important public mission of the school,” said Harrigan. The UNM Law School is also very successful in helping graduates secure JD advantage positions – jobs for which bar passage is not required but for which a JD degree provides a distinct advantage. Of the 111 graduates in the Class of 2014, 104 secured positions that were either bar passage required or JD advantage positions. 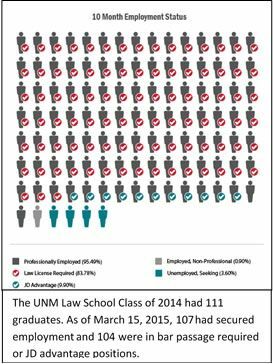 For the UNM School of Law Class of 2014, the rate for all types of employment (bar passage required, JD advantage, non-professional and part time) is 95 percent, 11 percent higher than the national rate. 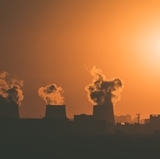 Lila Jones, who graduated from the UNM Law School in May 2015, competed against almost 400 applicants for 15 slots in the Environmental Division of the Department of Justice. She was successful, and in September, she will start her new position as a DOJ Honors Program Attorney. 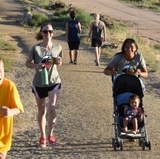 Mirroring the school’s admission policies, most UNM Law School graduates stay in New Mexico (85 percent for the Class of 2014). The second largest market last year was Washington, D.C.